For anybody with an IQ over 70, the current opposition to mosque construction in the United States—and not just the proposed mosque at Ground Zero—reflects nothing more than sanctioned xenophobia. The arguments of opponents betray a consistent pattern of ignorance—ignorance of the Islamic faith, of the mosque’s actual function, of the fact that opposition to mosque construction extends across the country, and is not just an exception made for the Ground Zero memorial site, and of the problems with fighting fire with fire. Perhaps most disturbing of all is how persuasive the right-wing’s glaringly hypocritical and fear-based rhetoric is to the average American, who eats it up with rabid, juvenile zeal. The first of these arguments, that the proposed mosque at Ground Zero is being sponsored by the same type of jihadists who murdered 3,000 people on 9/11, is simply false. The sponsors of the Ground Zero mosque are not jihadists—they are Sufists, followers of a moderate, peaceful, mystical branch of Islam. In fact, jihadists despise Sufism. As Wayne Besen of The Huffington Post explains, Sufists “hate” radical Islam so much, “that fundamentalists have intimidated many [Sufists] and attacked [their] shrines in the Middle East and Southeast Asia.” So, no, the Muslims sponsoring the Ground Zero mosque are not like the 9/11 extremists, and it is not valid to claim that all Islam is co-extensive with fundamentalist Islam; it would be like claiming all Christians are Crusaders or Spanish Inquisitors, and we know this is not true. In fact, if anything, the Sufists who propose the Ground Zero mosque are in the same boat as Christians—they are both the subjects of jihadist attacks, so, if anything, they should be standing in solidarity with one another. The second argument claims that these “extremists” want to build a “victory mosque” at Ground Zero. Well, this claim already falls apart since we have just proved that these Muslims are not extremists, so they could not be endorsing an extremist triumphal mosque in the first place. But let us grind this specious claim into dust with one further refutation. As Besen points out, the mosque endorsers “have gone out of their way to explain the project and mollify fears. The center represents an olive branch to other faiths and hopes to promote a peaceful brand of Islam.” Therefore, the proposed mosque is not intended as a symbol of extremist victory, but as a symbol of peace and solidarity among all people—regardless of their religion—who suffer at the hands of religious terrorism. How mosque opponents are able to interpret this interfaith peace-building mission as one of holy war and fundamentalist infiltration—especially when it is being proposed by people who are themselves being oppressed by fundamentalists—is beyond bizarre. According to the third argument, mosque opponents do not wish to ban Islamic institutions nationwide—they only wish to stop the proposed structure at Ground Zero. But this, too, is false. Islamophobes have opposed construction of Islamic spiritual centers and places of worship all across the United States. Take the example of the proposed Islamic community center in the suburbs of Nashville, Tenn. As Blake Farmer of NPR explains, “[r]ecently hundreds of protesters marched around the town square in Murfreesboro, Tenn. They carried signs that read, ‘Enough Is Enough’ and ‘Stop Terrorism’.” Meanwhile, showing that the sentiment was inspired by the 9/11 attacks, a woman in the crowd shouted out, “[h]ave you forgotten the twin towers?” (Apparently she is certain that the same people who would attend the proposed Nashville center are just like the jihadists who carried out the 9/11 attacks.) So, yes, opposition to the construction of Islamic institutions is epidemic in America. Following the logic of opponents, the establishment clause of the First Amendment to the United States Constitution suddenly becomes arbitrary and no longer counts when, say, a Muslim center is proposed at Ground Zero, or, say, in a Nashville suburb. Who knew it was so easy to cherry-pick constitutional rights? And yet these same people do not decry places such as Westboro Baptist Church, the followers of which are infamous for parading around with giant placards proclaiming, “God Hates Fags”, which, arguably, would instill terror in the spectator. Now just ask yourself, that doesn’t seem very fair, does it? Of course, one might argue, “but somebody can be a hypocrite and still be right.” True. And one might counter that this ultimately makes no difference, because we still have a First Amendment which says all of these groups can practice their religion freely—as long as they do not impinge on the civil and human rights of others. (And this includes criminal restrictions on malicious harassment.) And if we are going to inveigh against sharia law, let us not forget the Christian Bible, which justifies stoning adulteresses to death. One final point to be made is that some mosque opponents have actually invoked violence as a viable solution to the threat of fundamentalist Islam—which, ironically, they oppose because of its violence. Xenophobic tidbits are to be found everywhere on the Internet, but the following user comment, from the ultra-right-wing publication Front Page Magazine, takes the cake: “We are going to have to resist with violence and even then I think it is too late to save the country. The barbarians have breached the gates.” (A subtly jingoistic allusion to the Ottomans’ sacking of Constantinople, perhaps?) So the logic, then, is to defend against the one thing we fear—violence—with, well, with the one thing we fear—violence, hoping that “our” violence is a justified pre-emptive strike. But a pre-emptive strike against whom? We have already established that the Muslims sponsoring the Ground Zero mosque are peace-loving Sufists, not hijacking jihadists, so all we are left to assume is that these indignant and unruly spawn of the Judeo-Christian tradition would entertain the idea of inflicting violence on religio-cultural diplomats. The illogic is galling. We have established that opposition to mosque construction makes no sense for at least four reasons (there are more, but they would not accommodate the brevity of this article). The first is that the mosque is being endorsed by peaceful Sufists who are being oppressed by the very same type of jihadists who orchestrated the 9/11 attacks; the second is that the mosque is not a “victory mosque” symbolizing jihadist triumph over the West, but a gesture of peace proposed by said Sufists; the third is that mosque opposition is not just an exception made for the Ground Zero site, but is a nationwide trend that flies in the face of the very same constitutional protections that opponents themselves seek to preserve; and the fourth is that it makes no sense to denounce violence only to use violence to oppose violence—especially when your imagined “enemy” is not in fact the perpetrator, but a fellow victim of the same violence. We are left, then, with just one conclusion—mosque opponents are xenophobes. Can you provide a sound argument in support of the current opposition to mosque construction? Please share it with us. 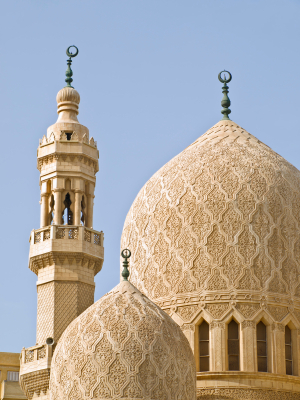 Visit our Guide to Divinity to gain more insight on Islam.